In 1973, the Kopernik Polish Cultural Society of Broome County organized in order to build a community observatory as a memorial to Mikolaj Kopernik. The Society's goal was for everyone in the region, regardless of ethnic background, to experience the universe firsthand at the new Kopernik Observatory. 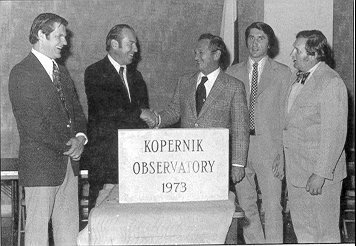 The Kopernik Society secured donations of materials, services and funds from the community and planned for construction to begin in the fall of 1973. General Contractor Edward Nezelek, a major supporter of the project, completed the observatory in the spring of 1974. When the Observatory was opened to the public in June of that year, the Kopernik Society donated the facility to the people of the Southern Tier to be operated by the Roberson Museum and Science Center as part of Roberson's educational initiative and to complement the major planetarium already in operation at its Binghamton site. For over 30 years, the Kopernik Observatory fulfilled its mission by bringing astronomy to families, groups and school classes from all over the area. In 1986 thousands of Southern Tier residents braved wind, ice and subzero temperatures to catch a glimpse of Halley's Comet. With major support from the Kopernik Society, the Decker Foundation, and many other community organizations, Roberson undertook a $1.5 million expansion of the Observatory to create the Kopernik Space Education Center in 1993. The new Kopernik Center created a complex of technology labs designed specifically for youngsters in grades K-12. The Kopernik Space Education Center is not only one of the best public observatories in the East, but also an outstanding science training facility unmatched in New York State.